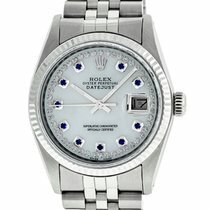 Rolex men's stainless steel Datejust with meteorite dial set with aftermarket genuine round diamond hour markers. Rolex White gold fluted bezel. Rolex automatic winding caliber 3035 with scratch resistant sapphire crystal. Rolex stainless steel jubilee bracelet with a genuine folding stainless steel claps with engraved Rolex crown. This mint condition genuine Rolex watch has been fully polished and overhauled. It has been time tested to insure accurate time keeping. All pre-owned watches sold by SGA Watches & Jewelry are refurbished to look like new. All of our watches come with SGA Watches 2 Years Warranty, Polishing Cloth and Wooden Watch Box. SGA Watches offers 14 Days return policy on all watches sold. The lug width is the width of the strap at the end that is attached to the watch. This is the interior distance between the two lugs (horn-like protrusions) on the watch casing. The strap will fit your watch only if the lug width of the watch is the same width as the strap. The buckle width is the width of the strap at the buckle end. If you want to keep your watch’s original buckle and replace only the strap, the width of the original buckle must be identical to the strap width. For watches with folding clasps, please choose a strap specially made for your particular clasp. The strap length is the combined length of the short strap side 3A (without buckle) and the long strap side 3B. For metal straps, the length of the strap including the clasp is measured in the closed position. Strap thickness is the height of the strap. Many leather straps thin out towards the buckle end, or “taper”. If you want to keep your watch’s original buckle and replace only the strap, the strap thickness must match the height of the original buckle. For watches with folding clasps, please choose a strap specially made for your particular clasp.